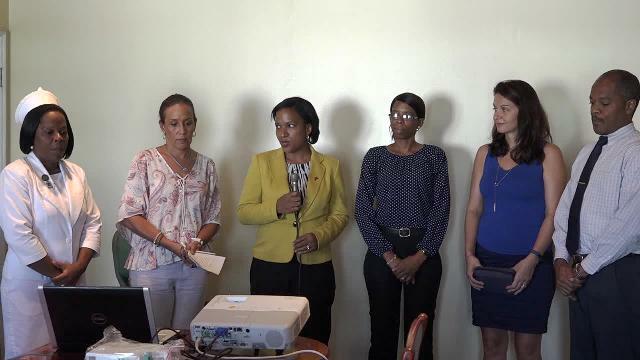 NIA CHARLESTOWN NEVIS (October 20, 2016) — President of the Paediatric Assistance League of St. Kitts and Nevis Giselle Matthews (PALS) says the organisation wants to provide more assistance to Nevis. 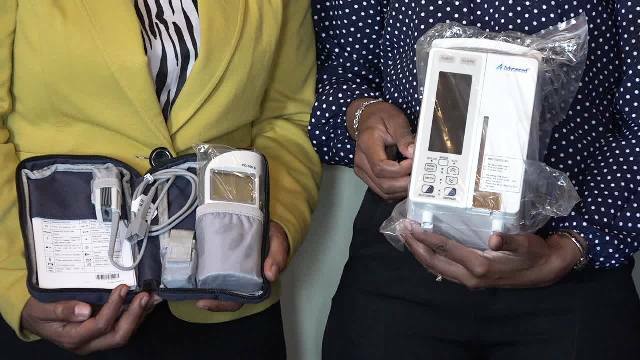 She made the comment when the League’s Treasurer Carolyn Chisholm handed over a Pulse Oximeter and an Infusion Pump to Hospital Administrator Gary Pemberton for use at the Paediatric Ward. The handing over ceremony took place at the hospital’s conference room on October 18, 2016. “It is our hope and intention to become more involved with Nevis and to assist Nevis in a greater capacity. “We have a donation today of some equipment to assist in the Paediatric Wing of the hospital. This equipment does allow for premature babies, babies who have challenges at birth, we can regulate the oxygen levels in the blood. We hope to be able to donate further as we continue our fund raising drive,” she said. Matthews, explained that the League’s main purpose is to raise funds for children who need medical assistance abroad and cannot afford it and it is the biggest part of what they do. However, she noted that it could not be done without the help of support partners World Paediatric Project based in Virginia, USA with a mission in St. Vincent. “Without their assistance, we would never be able to afford the medical care that they are able to provide for these children – major surgeries, missions to St. Vincent, children have gone off to Virginia to the hospital there, to the Cayman Islands for heart. I think, close to US$5 million spent on us in St. Kitts and Nevis alone and that doesn’t include the region,” she said. Matthews, underscored the importance of assisting the League in its fund raising drives, which assists the Ministry of Health. She expressed the view that the government alone could provide medical assistance for the children and therefore, all should contribute to assist. She also thanked Dr. Ian Jacobs, who she said plays an integral role. As a member of the League who works with health facilities in the Federation he is able to identify the medical needs. In response to the donation, Hospital Administrator Gary Pemberton thanked PALS for the donation on behalf of the patients and staff of the health facility. He said the equipment would would help at the Paediatric Ward and assist in the provision of quality health care service at the hospital. Permanent Secretary in the Ministry of Health Nicole Slack-Liburd, welcomed the donation and acknowledged the League’s assistance with providing urgent medical attention overseas for children on Nevis. She thanked them for their continued generosity and partnership. 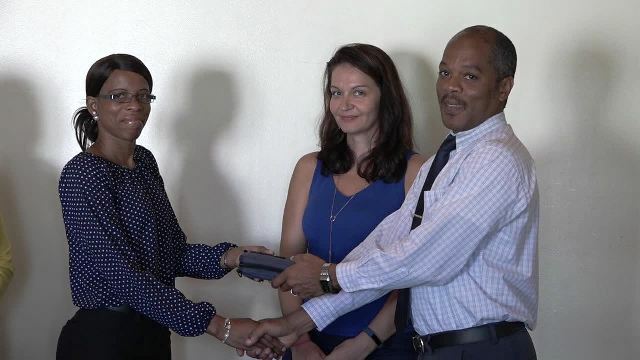 Meantime, Paediatrician at the Hospital Doctor Cleo Smithen said although the donation seem a tiny device, it is vital in the continued effort to provide optimal care for the paediatric population on Nevis. “The infusion pump is a device that is used to administer fluids to patients in a very controlled manner, especially in very small amounts that normally cannot be administered via IV fluids. “The Pulse Oximeter is used in very critical patients to check for the oxygen saturation in their blood and these two deceives are very, very much needed at the Paediatric Ward where we do have sometimes some very dramatic cases,” she said. Others at the ceremony were top managers at the Hospital including Matron Aldris Pemberton-Dias, Medical Officer of Health Dr. Judy Nisbett and Jaqueline Brown King, Director of World Paediatric Project in the Eastern Caribbean.